I’m a nerd – through and through. I’m a nerd of cinema, comics, music and just generally pop culture. Something that has always fascinate me is actors who transition between regular roles and roles which involve them taking on superheroes. Until Family Guy stepped in Adam West, for me, had always been known as Batman. Christopher Reeves may have done other roles but to me, he’ll always been Superman. Robert Downey Jr. is now forever solidified to me as Iron Man or Chris Evans as Captain America. I’ve seen these actors play these roles for so long and so well that to see them in another movie would be the equivalent of a dog walking on its hind legs to me. On the other hand, there are actors who have successfully broken this mold for me. Michael Keaton, for one, has gone on from Batman to films like Spotlight, Multiplicity, White Noise & The Founder. Christian Bale, another Batman actor, has successfully gone onto a career filled with cinematic outings like Vice, The Big Short, American Hustle & The Fighter. 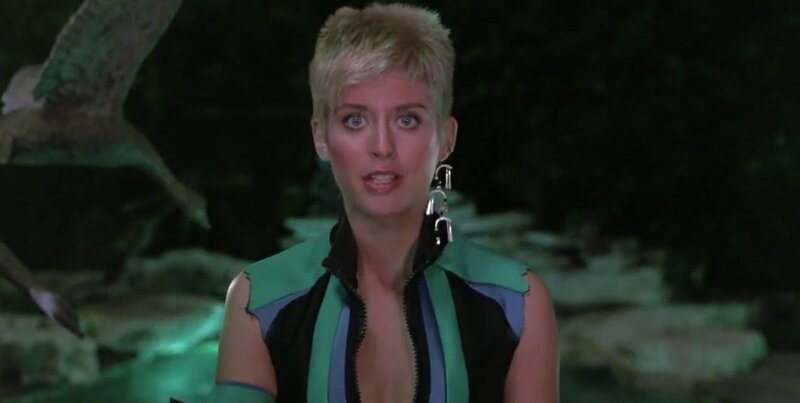 Then, there is actress Helen Slater. Just a year after playing Superman’s cousin, the Girl of Steel herself, Supergirl; she turns into another type of hero – Billie Jean. For all those curious, it’s not that Billie Jean. She is not the girl who thought Michael Jackson was the one. Slater stars along side Christian Slater (no relation), in this underrated 80s flick. The Legend of Billie Jean tells the story of brother and sister, Billie Jean & Binx, who become outlaws after doing the right thing goes awry and a revolution is birthed. Both Slaters deliver such strong performances within the confides of this film. Helen, in the role of the titular character, aggressively attacks the role with such charisma and strength. Helen manages to be both the sweet girl and total rebel here. It’s not like there is this dual personality going on. One emotion of the character progressively becomes the other. This arc allows Billie Jean as a character stand out magnificently. You can’t help but cheer for Billie Jean towards the film’s climax. One thing that I seriously respect about this movie was that they weren’t afraid to take the character of Billie Jean to some dark places – including sexual assault. The Legend of Billie Jean feels like the hero of the #MeToo movement, before the movement was a movement. Making Legend a film more relevant now than ever and Helen as the film’s poster girl, watch out because she delivers a heck of a performance. Then, there is Christian. A lot of us have come to know him through other IPs like Interview with the Vampire & Mr. Robot. This is early within the actor’s career and he delivers the charm and lovable nature. Christian feels a bit more like a sidekick, though, than actual brother. He’s goofy and lovable in the same breath. While most times that’s perfectly fine with the confides of the film – especially in the film’s climax – he can come across as less than compared to the rest of the cast. Overall, The Legend of Billie Jean, is a must watch. Helen Slater delivers a strong, convicting performance as the film’s hero that proves fair is fair. She is the voice of multiple genres that prove justice is real and should be real. With a beautiful arc, awesome soundtrack, and genuine humor – Legend is truly a must watch. This Mill Creek Retro VHS Collection edition of the film is a great and affordable way to check it out! Helen and Christian Slater are not related. Correct. As the editor, I take responsibility for that error, as I clearly didn’t read this piece in depth before posting. We will fix it, thank you so much.